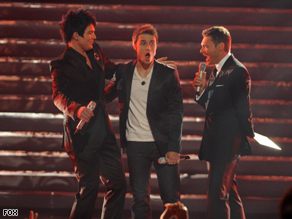 Even "American Idol" winner Kris Allen couldn’t believe it. “American Idol’s” Adam and Kris join CNN’s Larry King and take your questions! Angry, die-hard Lambert supporters wondered if viewers had resented the assumption Lambert would win, if religious fans had galvanized to support Allen, who reportedly has done some missionary work, or if Allen had simply absorbed the supporters of Danny Gokey, who placed third on the show. And they questioned why, with reportedly almost 100 million votes cast, “American Idol” host Ryan Seacrest didn’t announce how close — or far — the election had actually been. “The fact that they didn’t give [the vote tally] that separated them to me suggests that it wasn’t close,” said Brian Mansfield, who blogged about the show for USA Today. Mansfield pointed out that when Gokey was eliminated, it was announced that only a million votes had separated Allen and Lambert to place them in the finale. Lambert as a contestant was extremely polarizing, Mansfield said. “There were people that really loved Adam and there were people that really hated Adam and there weren’t a whole lot of people in the middle,” he said. Vocal coach Heather Kent said she was shocked that Lambert wasn’t able to pull off the win. Watch Allen claim victory » “I was crazy about Adam Lambert,” said Kent, who runs a vocal studio in Boston, Massachusetts, and has worked with many artists in musical theater. “He was very polished and the voice itself was stellar.” Elayne Rapping, a professor of American Studies at the University of Buffalo and pop-culture expert, said that “Idol” — which is about to top the Nielsen ratings for the fifth straight season — has become “a national obsession in the same way that maybe baseball used to be or the Super Bowl.” “People really take it seriously,” she said. “They watch it and they are very emotionally involved in it.” That emotion was high on CNN’s “Idol” blog. Some posting vowed to “never watch the show again.” Some compared the upset to the wins of past “Idols,” such as Ruben Studdard and Taylor Hicks, who have struggled to find the success that some of the runner-ups have. But Allen fans were thrilled that their contestant won. Nate wrote, “America got it completely right.” Jon in Texas wrote, “Like I said weeks ago, Kris is the most ‘radio ready’ of this season and that’s what this competition is about …” The announcement of the winner wasn’t the only surprise of the night. Performers as diverse as KISS, the Black Eyed Peas and Steve Martin were on hand to thrill the crowd. Watch the stars arrive on the red carpet » Beleaguered judge Kara DioGuardi shocked the audience when she flashed a skimpy bathing suit after singing Mariah Carey’s “Vision of Love” during a skit that pitted her against a former aspiring contestant known as “Bikini Girl.” Allen and Lambert appeared tired yet buoyant as they enjoyed knockout performance pairings: Allen with Keith Urban, Lambert with KISS and the pair with Queen. The competitors, who were roommates early on in the “Idol” mansion where contestants stay, are friends who have had nothing but praise for each other throughout the season. That continued after the finale as Lambert was gracious in defeat. “I knew it was going to be a close race,” Lambert told the news media. “I think Kris is incredibly talented and he’s a good person. We got to do a really cool finale and we’re both going to get to do great things in the future so for me it’s not really about what happened tonight, it’s about tomorrow, it’s about next.” Allen said he was “exhausted and shocked” and looked forward to now being able to see his wife of less than a year more often. Lambert, Allen said, is an “amazing, amazing performer” who “deserves this as much as I do.” But there can only be one “American Idol” at a time, and Allen sounded ready to take his place in “Idol” history. “Adam does his thing and I’m going to do mine,” Allen said. “That’s what I’ve done through the whole competition and I think it worked.” Allen and Lambert are scheduled to appear Friday on CNN’s “Larry King Live” and viewers can post questions for them on Facebook.